I've been living in London for just over 7 months now, which doesn't feel like a long time but it wasn't long before I started becoming accustomed to London life and the little changes that come with living here as opposed to home (Gibraltar) or my little university town (Bournemouth). 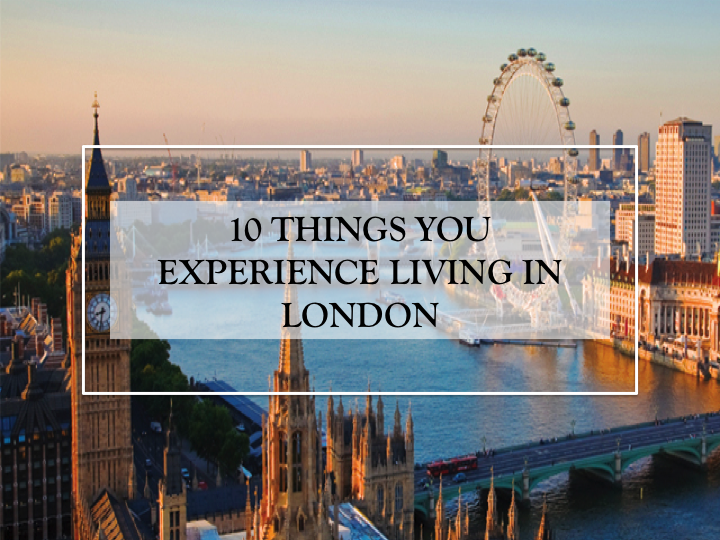 So here are 10 things I've picked up on whilst living in London. 1. To start with the obvious, it's bloody expensive. Paying £800 to live in a box in Kensington which would rival Harry Potter's cupboard under the stairs is the norm here. Luckily I managed to find a pretty nice house in Wimbledon with wonderful housemates for that price - unfortunately it doesn't end there, add on the daily commutes, Tesco meal deals and you're left with enough money a month for a £9 cocktail in Soho. 2. "City Mapper", "The Train Line" and "Tube Map" apps become your bibles when trying to get around in London, especially when its 3am on a Friday night and you're alone and tipsy in the middle of Leicester Square. You'll also forget what it feels like to be in a car for a long period of time. 3. You plan your weekends by searching through the "free stuff to do in London" tag on Pinterest, but then realise there's only so many museums, parks and landmarks to see before you wonder off into the closest Urban Outfitters and spend £25 on a beanie. 4. Your friends around the country suddenly become more eager to come visit you at the capital, or rather use you for a bed and breakfast. You also then become the no1 source for providing all the "hot spots" in London to eat, party and see, when in reality you spend most of your time in bed watching Netflix and probably only explore these places every other weekend or when you have to act as a fun host for your friends. 5. Before you lived here, Oxford Street, Westfield's and Camden Market were a fun day out, now you try to avoid shopping there as much as you can to avoid the swarm of tourists. Not to mention you also start getting agitated with slow walkers and tourists who can't seem to keep up with your new found London pace. 6. Thursdays are the new Fridays - well every night of the week is because there's always something going on or an excuse to drink. You'll also stumble across a bar that's offering cocktails for £5 which is very rare so you must take up this opportunity. 7. Going to concerts, festivals, weird events and musicals has never been easier because they're all on your door step. No need for booking hotels or trains or finding people to stay with, as it becomes the opposite. (refer to point 4. for friends using you as a hotel instead). 8. You realise how extremely annoying is when you don't have enough money on your oyster card for a bus journey or a contactless card, so if you've got a mean bus driver you're left to walk in the rain *sobs* On another note, you feel extremely stupid when you say "thank you" to a bus driver in London because it's either unheard of or they won't even acknowledge you. 9. The cold can be unbearable, but it feels like you've been sent straight to the pits of hell when you're crammed on the Central Line at 5pm on a week day. You finally start to understand why locals on the tube look like they're heading straight to their death beds - have you actually ever seen anyone crack a smile on the tube? 10. Despite all this, you realise it's the best place in the UK to live for opportunities, experiences and living life to the fullest. You also feel slightly cooler and more independent for living in London than your non-Londoner peers because well, it's London. Awesome article! :) I only visited London once, but I definitely want to come back this year! It's pretty expensive that's true!